for a finicky dinghy motor. "Where would you suggest we go next?" I asked Kirk, the Bocas Yacht Services yard manager, the yard where our mast was being pulled. "Escudo de Veraguas, about 50 miles from here," he suggested. "It's beautiful, relatively deserted and there's miniature sloths there! Park on the lee side of the island. Which side that is will depend on the conditions"
Guide books are great, but given me local advice and fellow cruiser feedback for really swaying our discretionary stops. Guidebooks rarely say, DO. NOT. MISS.THIS. Even when they do, often it's more the touristy kind of destinations, rather than the quiet wonder you find in the raw beauty of a pristine, isolated spot. gateway to the Panama canal's Caribbean side, is to the far right of the dot. Kirk's lived in the area for several years, and strikes me as a pretty understated guy; trustworthy. And there's nothing like sweltering, deet-covered in a dusty, no-see-um-ridden yard to inspire you to plan your next fun stop. to offer good snorkeling, though not in our anchorage. We decided to not try to get up at the crack of dawn to try and make Ilsa Escudo de Veraguas a long day trip, assuming perfect conditions, and we decided as well not to do sail overnight. We stopped first just outside Bocas, at Cayo Zapatillo. There was enough swell, we left our dinghy on the davits, crashed, and left the next morning. We sailed an easy half day from there to the calm bay of anchorage Laguna de Bluefields (click here to learn about Laguna deBluefields), then from there to Escudo de Veraguas. Escudo de Veraguas between Bocas del Toro and Colon Panama. Turns out, there was no lee side anchorage during our Escudo de Veraguas stay, which sometimes happens there. While Cayo Zapatillo was pretty, Escudo des Veraguas was lovely. Our desire to get in some walkies in this beautiful spot overcame our trepidation of breaking waves and an uncooperative dinghy motor. Indeed, the waves broke over our transom and dragged our wimpy dinghy anchor, forcing us to beach rather than anchor our dinghy and swim in, as originally planned. A pleasant teenaged couple greeted us as we came ashore and in our stumblingly inadequate Spanish, we got the blessing for walking past their village. To our surprise, it appeared they were the only ones one the island; we're guessing at least some of the other residents were off, fishing. We didn't envy them in their kayukas in those conditions. Escudo de Veraguas jungle trail. At the far side of the shoreside village, the beach ended at cliff, thwarting our ability to mosey further along the shore. Our choice was to follow the jungle trail, or double back. 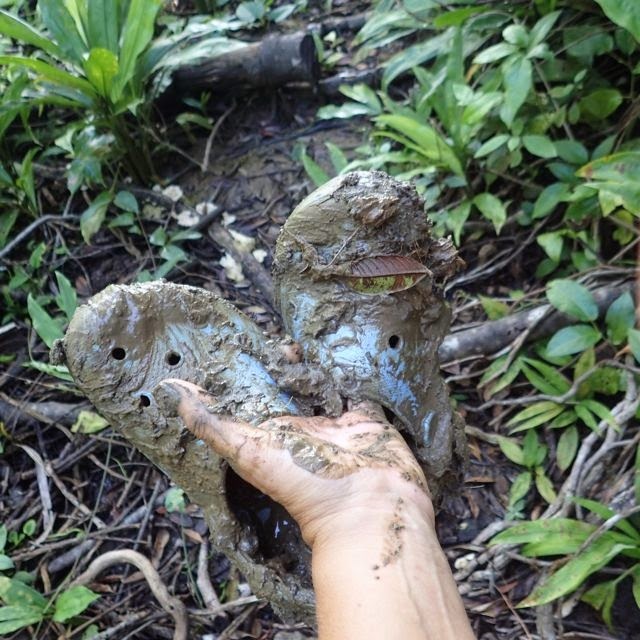 I scouted the trail, which rapidly became a thick, sticky mud. We opted to backtrack. Our Bauhaus guidebook photo showed a stunning arial view of another part of the island, which I'd hoped we could reach on foot. 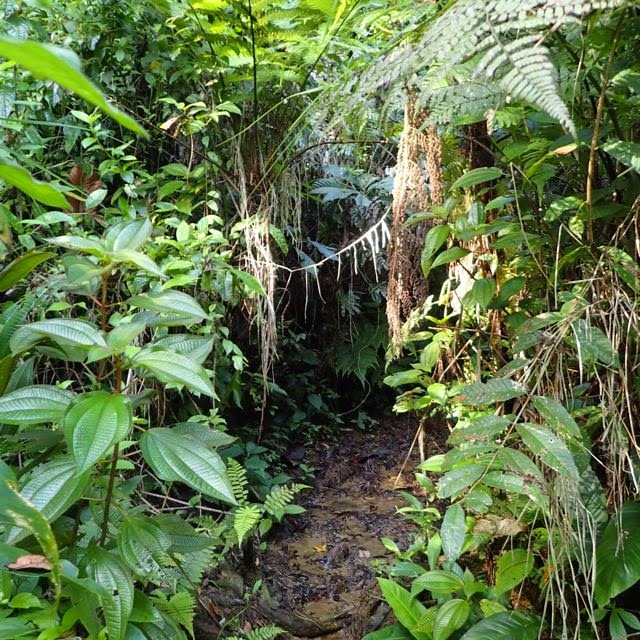 It was a broad, shallow, enticingly crystal-clear riverbed, fringed with verdant foliage. Maybe we could reach it after was passed our starting point. The teens we met earlier offered us several small green coconuts. After Bluefields, we assumed we could only take them if we had something to offer in return, and we had nothing to offer. In our vast language barrier, we hope we did not offend them by not accepting their gift. Miniature sloth! Oh, umm, errr, it's just a termite's nest. We enjoyed a pleasant hike even though we didn't see any sloths or find the stunning spot that tantalized us from the Bauhaus guide. There was no way we were going to risk tackling the conditions in such an isolated spot with our unreliable dinghy motor. * Our dinghy ride back to the boat was blissfully uneventful. After a night of moderate rock 'n roll, and no sense the conditions would calm, we made way for our next stop. Later, when we bumped into a fellow cruiser who'd stopped at Escudo de Veraguas, she commented, "Oh, that place is rolly when it's calm. You must've been really rolly!" Yup; though we've stayed at much worse. 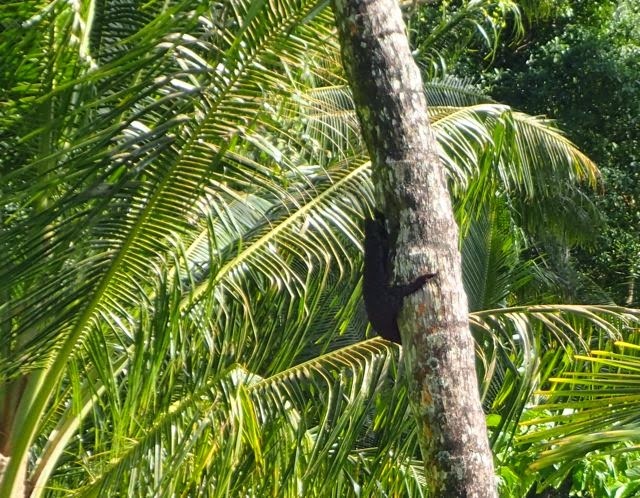 We've yet to see sloths, howler moneys, jaguars or toucans in the wild here in Panama. I'm sure we will. 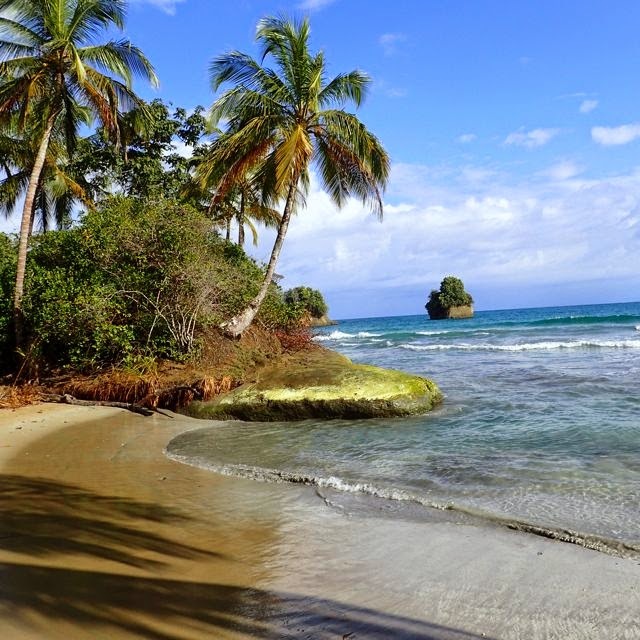 Meanwhile, Escudo de Verguas is a lovely spot, a great way to break up the long, nasty, Golfito des Mosquito stretch between Bocas del Toro and Colon. And I'm ok waiting, rather than risking a barefoot walk in sticky mud or relying on herculean strength to keep them my crocs from becoming a permanent addition to the landscape. into the jungle trail on Escudo de Veraguas. We're in Shelter Bay, Panama right now (N09.22.033 W79.57.097). 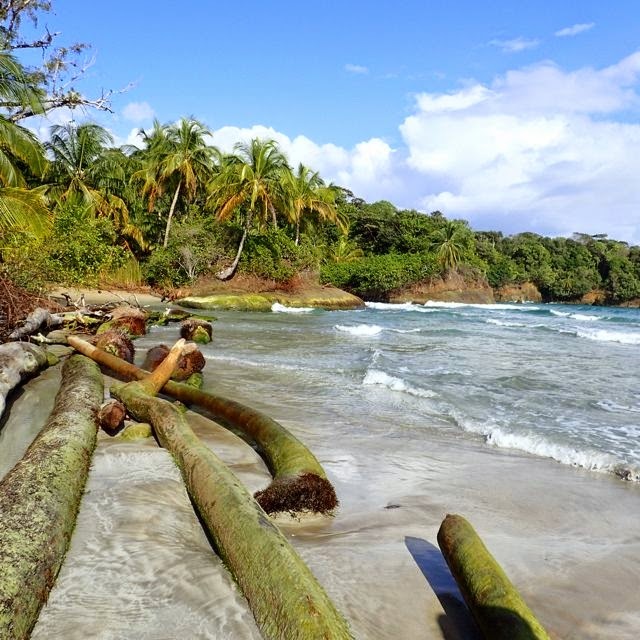 This is a recent retrospective of our January 26, 2015 stop at Escudo de Veraguas (N09.05.307 W81.34.099) between Bocas del Toro (N09.20.041 W82.14.606) and where we are now. We'll stay near the area for another week and a half as it's our start point across "the skinny bit" -- gateway to the Panama canal, where we'll cross from the Atlantic (Caribbean) side to the Pacific. From there we'll begin our South Pacific adventure.